A. (?) married W. K. Hughton. Clara E. (?) married Edward H. Houghton. Henry Houghton married Hannah J. Wickham. Hannah J. Wickham married Henry Houghton. Harriet Houghton married William James Zimmer. William James Zimmer married Harriet Houghton, daughter of Henry Houghton and Hannah J. Wickham. Caroline (?) married Isaac Newton Haughton, son of Phebe Haughton. Elizabeth (?) married Ephraim Whitcomb Houghton, son of Daniel Houghton and Betsy Wetherbee. Judge Tippo Sahib Haughton married Elizabeth Moseley. Elizabeth Moseley married Judge Tippo Sahib Haughton, son of Malachi Haughton and Eliza (?). William Moseley Haughton married Effie Jeanne Betsworth in 1888. Alexander Moseley Haughton married Ellen Frances Priddy in Sep 23, 1885. Malachi Haughton married Martha Edwards Hollister in 1885. Joseph Husson Haughton married Theodora C. Thompson in 1889 at Fredonia, NY, USA. 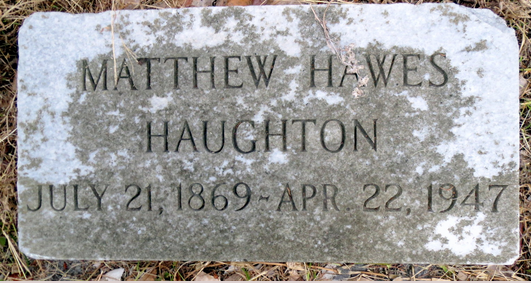 Matthew Hawes Haughton married Emily Daniel in Jun 23, 1908.